A student stands in the ruins of one of his former classrooms, which was destroyed in June 2015, at the Aal Okab school in Saada, Yemen. Students now attend lessons in UNICEF tents nearby. 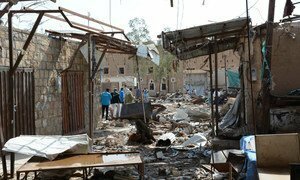 Yemen’s education system has been devastated by the country’s brutal conflict, the United Nations Children’s Fund (UNICEF) said on Tuesday, reporting that at least half a million children have dropped out of school since the 2015 escalation of the war. According to “If Not In School,” the total number of out-of-school children now stands at 2 million, and almost three quarters of public school teachers have not been paid their salaries in over a year, putting the education of an additional 4.5 million children at grave risk. An entire generation of children in Yemen faces a bleak future because of limited or no access to education. More than 2,500 schools are out of use, with two thirds damaged by attacks, 27 per cent closed and 7 per cent used for military purposes or as shelters for displaced people. Children risk being killed on their way to school. Fearing for their children's safety, many parents choose to keep their children at home. The lack of access to education has pushed children and families to dangerous alternatives, including early marriage, child labour and recruitment into the fighting. UNICEF appeals to the warring parties, those who have influence on them, government authorities and donors to put an end to the war, pay teachers, protect children's education unconditionally, and increase funding for education. On 26 March 2015, a coalition of countries led by Saudi Arabia intervened militarily at the request of President Abd Rabbuh Mansour Hadi to secure the return of the Government to Sana’a, which had been seized by Houthi militias and allied units of the armed forces when the conflict initially erupted in 2014. Three years on, the fighting is still raging and the ensuing humanitarian crisis has only deepened in a country that was already one of the region’s poorest. The UN, through its envoy, has been engaged in helping Yemenis to find a peaceful solution. UN agencies and partners are also on the ground to deliver life-saving aid. Learn more about the findings of If Not In School here. Three years after a Saudi-led coalition intervened in the Yemen war, and hours after reports that Houthi rebels fired missiles at cities in Saudi Arabia, United Nations Secretary-General António Guterres on Monday said military escalation is not the solution and urged restraint on all sides.